Texas Instruments CONCEPT II distributed by Zayre Corp.
You have to look twice to catch the differences between this rare CONCEPT II and the TI-1250 calculator. The only differences between the calculator is the color scheme of the faceplate. 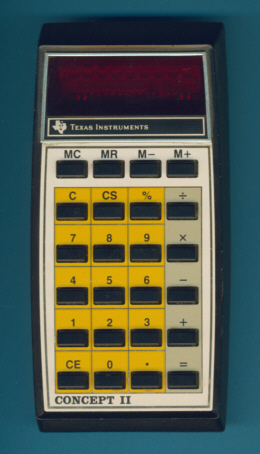 The CONCEPT II calculator was introduced in March 1976 and discontinued already in January 1977 with the blow-out sales of the CONCEPT I, CONCEPT II, CONCEPT 10, and the 2nd and 3rd design of the CONCEPT 24 calculators.